The Ford SVT Mustang Cobra R is our featured muscle car in this edition of Muscle Car Milestones. Developed by Ford’s newly-formed Special Vehicle Team, this snake was a factory-bred, street-legal racer with minimal frills but loaded with plenty of performance equipment. The Cobra R also brought back the factory racer that had been absent from Ford’s lineup for way too long. Quite simply, there was nothing quite like the Cobra R during its three year production run. So what does the “R” actually stand for? Racing, radical, or maybe even rebellious? No matter what it symbolizes, this car had no equal during its brief existence. Let’s find out what makes the Cobra R a sought out favorite by Mustang collectors. The first SVT Mustang Cobra R was unleashed during the final year of the Fox body style. All 107 cars came painted in Vibrant Red with blacked-out window trim. The Cobra R is also easily identified by its 17-inch, 6-spoke aluminum wheels painted in black with bright center caps. The interior was pretty lackluster and devoid of anything that added unnecessary weight. Creature comforts such as air-conditioning, radio, and power windows were not installed. The back seat was also taken out along with any sound deadening materials. The front seats for all Cobra Rs were covered in gray cloth. Yep, the interior was about as simple and basic as a lowly Ford Festiva. Underneath the Cobra R’s hood lurks a 5.0-liter OHV V8 cranking out 235 horsepower and 280 foot pounds of torque. Mated to a Borg-Warner T-5 five-speed manual, it was capable of running from 0 to 60 in 5.7 seconds and the quarter mile in 14.3 seconds running 99 mph. Ford made no modifications to the standard Cobra engine and drivetrain. Instead, the SVT group focused on what was needed to make the Cobra R track capable. Components that made the Cobra R a track focused racer include heavy duty MacPherson struts, Koni shocks, and a front-strut tower brace. A 31-millimeter stabilizer bar, rigid axle, and progressive-rate coil springs also contribute to its track capabilities. To bring everything to a standstill, 13-inch vented discs with twin-piston calipers up front and 10.5-inch vented discs with single-piston calipers in back were always on standby. The downside to the Cobra R is it got no factory warranty, had a hefty $27,000 price tag, and buyers had to have a valid racing license in order to get one. A year after introducing a new body style with retro-inspired styling cues, Ford brought back the Cobra R. Again, if you wanted one of these street-legal racers, you had to prove to Ford that you intend to race the heck out of it. All 250 of these competition-ready coupes were snatched up in just five days. They still came without frills such as air conditioning, radio, and back seat. The only available color was Crystal White with blacked-out window trim and black mirrors. The Cobra R is also easily identified by its bulging, fiberglass hood that rises above the engine’s high intake system. For 1995, the Cobra R got its own unique engine. Pop the hood and you’ll see a 5.0-liter engine churning out 300 horsepower and 365 foot pounds of torque. This 351-cubic inch Windsor engine comes coupled to a Tremec five-speed manual transmission. With this combo, Car and Driver was able to launch the Cobra R from 0 to 60 in 5.4 seconds and sprint the quarter mile in 14 seconds running 99 mph. In order for the Cobra R to dominate the track, it was equipped with heavy-duty progressive-rate springs, 30-millimeter stabilizer bar, and a front strut tower brace. Out back, the Cobra R got a rigid axle, adjustable vertical shock absorbers, and a 27-millimeter stabilizer bar. The Cobra R’s ABS braking system consisted of 13-inch vented rotors with twin-piston calipers up front and 11.65-inch vented rotors with single-piston calipers in the rear. For its final year of production, Ford sent the Cobra R out with a bang. For starters, styling was much more radical than the 1993 and 1995 models. Features that set the Cobra R apart include a unique front air splitter, side exit exhaust, and a tall rear wing spoiler. All 300 Cobra Rs produced this year wore Performance Red paint and came equipped with 18-inch 5-spoke aluminum wheels with exclusive BF Goodrich g-ForceKD tires. And just like its predecessors, the 2000 Cobra R did away with luxuries that added weight such as air conditioning and stereo system. Sound deadening and the rear seat were also jettisoned in favor of weight reduction. According to Ford, the 2000 Cobra R was the quickest factory Mustang ever created when it hit the streets. That’s thanks to its 5.4-liter engine with 385 horsepower and 385 foot pounds of torque. The transmission of choice for 2000 is a Tremec T-56 six-speed manual. With this combo, Car and Driver walked away with a 0 to 60 time of 4.7 seconds and a quarter mile time of 13.2 seconds at 110 mph. All this performance didn’t come cheap. With a sticker price of around $55,000, the 2000 Cobra R was quite pricey but at least buyers didn’t have to have racing credentials like before in order to buy one. The good news is all this dinero got you quite a bit of performance equipment. 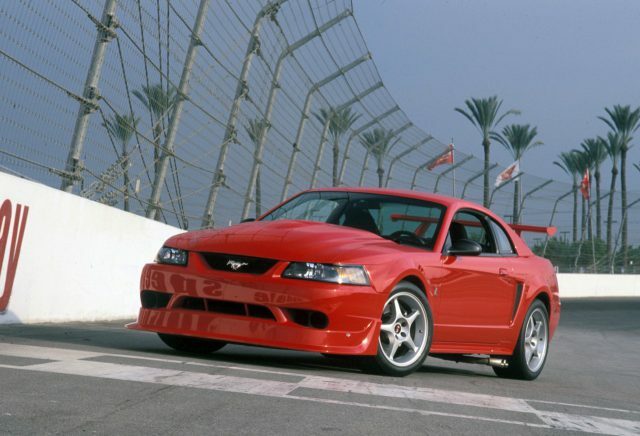 Front and rear vented disc brakes, Bilstein shock absorbers, and Eibach coil springs are just a few of the goodies Ford built into the 2000 Cobra R.
The Ford SVT Mustang Cobra R was a clear indication that Ford’s Special Vehicle Team was serious about creating a track-ready factory race car. The Cobra R’s only true competition came from aftermarket tuners since Chevy or Pontiac didn’t fire back with their own barrage of factory racers. Today, the Cobra R is still highly sought out among collectors on the secondary markets. Prices aren’t cheap but that’s the price you pay to own one of the rarest Mustangs ever produced.